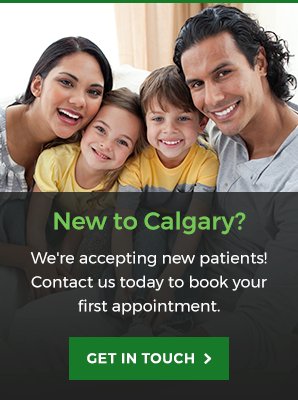 Go Dental in Calgary provides dental veneers for patients who wish to correct discoloured, chipped, gapped, misaligned or aged teeth. Veneers are thin, specialty made shells made of tooth-coloured materials that cover the front surface of your teeth. Each tooth will have a shell bonded to its front surface in order to change the appearance of the color, shape, size or length. The shells are typically made from either porcelain or resin composite materials. Veneer treatment may require the removal of healthy tooth structure. If you are looking for a quick fix, you are in luck with veneers at Go Dental in Calgary. Typically, our plastic veneers can be done the same day and the results can be seen very quickly. They are require a very conservative approach and do not require any drilling of your teeth. While porcelain veneers take a bit longer to create than plastic veneers, they are also a great option. Along with durability, they are designed to last longer. The molding and creation process usually takes 1 week. Interested in veneers? Contact us at Go Dental today to book your appointment! We're open 7 days a week for your convenience.